Chris Theberge, LP® artist and percussionist with Groove Collective, performed recently with the group at the Mercury lounge in New York City. Although the band was short a few members, it still sounded great. 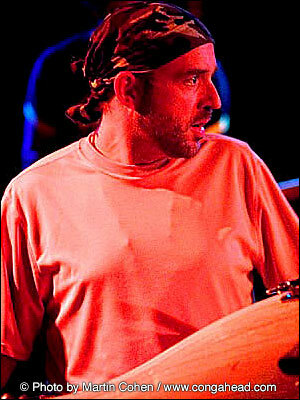 Chris, who played congas and an LP® bata drum, put special emphasis on the full complement of LP® gear he was using. Among the Groove Collective members assembled at the Mercury Lounge, were Chris Theberge on congas and bata drum, Genji Siraisi on drums, Gbatokai on bass; Pablo Vergara on keyboard, J. Rodriguez on saxophone, and Takuya on trumpet. The Mercury Lounge is a noteworthy bar and music room located on East Houston Street, and a fine venue for all music lovers.